Faculty/Staff listings can be generated for your department’s WordPress site based on the information in HR’s PeopleSoft database. The listings refresh themselves nightly, so any changes in staff, titles, or contact information will be reflected on your website automatically. A default directory listing for every person assigned to a department may be displayed by placing the following shortcode into the visual editor on the listing page. 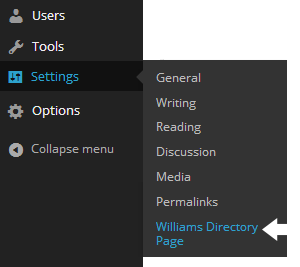 In order to use this tool, the “Williams Directory” plugin needs to be active. In most cases, your faculty/staff list will be set up by the web team when your site is moved into WordPress. 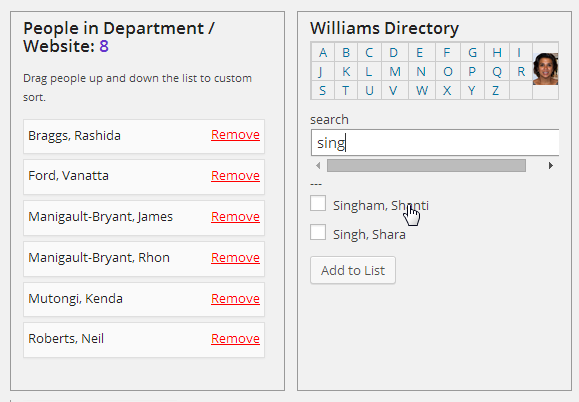 To make adjustments, go to Settings -> Williams Directory Page (shown left).On the Williams Directory settings page, you can add everyone in a department, add individual faculty or staff members, and sort your list. To add all the faculty/staff in one department, select the department from the drop down menu (see below). This step has probably already been done for you. The “People” section (shown below) shows all the faculty/staff associated with the selected department. You can modify who appears in the list, and in what order. Add: To add a person, click the first letter of their last name, or type in a portion of their name into the search box. A list of matches will appear. Click on the person’s name, then click the “Add to List” button. Remove: click on the “Remove” link next to somebody’s name to remove them from your site’s listing. Only names that have been added manually- ones in addition to the department selected- will have a remove link. Sort: the list starts in alphabetical order, but often departments want their chair or administrative assistant listed first. Drag and drop the boxes in the left column to reorder them. When new faculty/staff are hired, their names will appear at the bottom of the list- you may want to check and re-sort your list at the beginning of each semester. Don’t forget to click the blue “Save Changes” buttons after making changes. If you’d like to have each name in your directory listing link to a customizable profile, type “profile” in the “Link Names to Profile Page” box located (outlined in red below). If your listings page has not already been set up for you, you can append the listing to an existing page (select a page from the “Page Links To” dropdown menu shown above) or create a new page (enter a title for “Add New Page”). Replace “unixID,unixID…” with a comma separated list of Williams user IDs belonging to the people you want to be shown in your listing, in the order you want them to appear. You can add extra fields from staff profiles by entering a comma-separated list of field IDs, in the order they should appear, using the following format. Note: this will force single-column display to include the extra information. This option should not be used for live directory listings. You may output a list of unix IDs for each person who has been assigned to your directory page via the Williams Directory settings (as described above — Dashboard -> Settings -> Williams Directory Page). This is helpful for adding LDAP users in bulk to create Faculty/Staff profiles.